I know there are people who are afraid of heights...I am lucky I'm not. Last April, the client SVP visite the Center and one morning after a long night shift...we decided to climb the roof of the building to see how we did all the civil works. 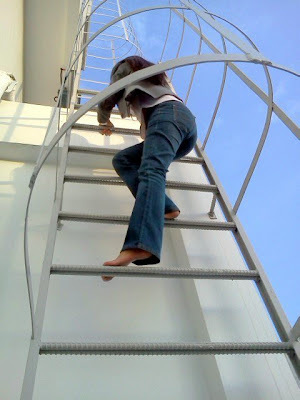 Now the boss wanted me to climb...which I have no problem with, except that I had to remove my high heels. Good thing I was wearing jeans! So this is the Site Director of one of the call centers in the Philippines Mariposa...backwards...after the climb! It was fun! I have another photo which could have been a nice one for this week's theme as well but I thought I might need to post something that might let me explain the things that kept me busy for months now. I'm very excited what others have. Let's go visit PhotoHunt! Nice shot. I'm terrified of heights but have gone up those ladders. cool take on the theme! Those rungs look like that might hurt your feet. It's much easier to go down those stairs backwards as strange as it seems. yeah that would have just freaked me out! i have acrophobia. am afraid i can't do this. That is a really good one for the theme. I am one of those people who could not walk up that ladder! I love this shot. I too am terrified of heights. Geez ! and I get already dizzy on a balcony on the 3rd floor, lol ! Don't talk about a ladder then !